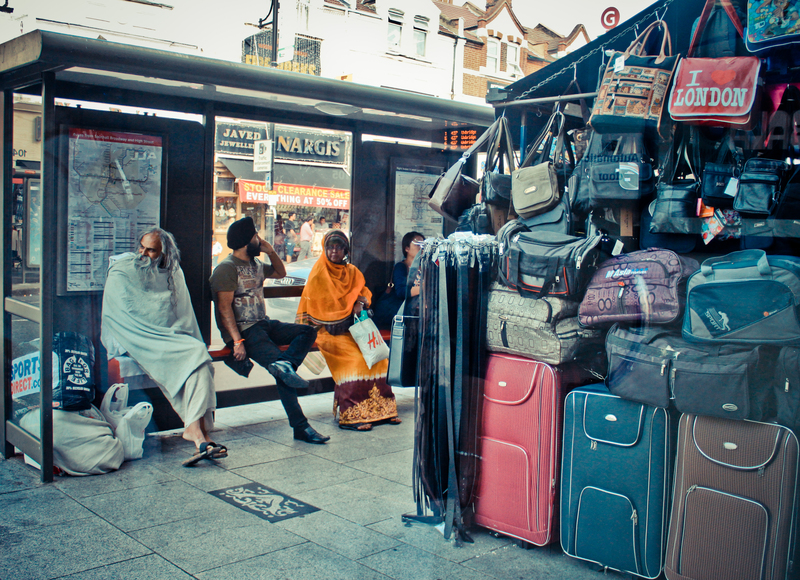 At a bus stop in Southall, a suburban district of West London (UK), residents of the neighbourhood wait for the bus to arrive. My introduction to this visual carries a simplicity that emphasises the mundane and the routine of ‘everyday’ life that both constructs and is constructed by social space. Behind that cursory ‘first look’ lay a number of sociological realities that allow us to theorise, intellectually and affectively, the lived politics of home, belonging, and identity. Ahmed (1999) argues that transnational journeys of subjects, in the present or in the narrated past, invite us to consider what it means to be at home, to inhabit a particular place, and to question the relationships between identity and home. ‘Home’, thus, always is an encounter between those who stay, those who arrive, and those who leave. Brah (1996), elaborates on the notion of ‘diasporic space’ – real and imagined social spaces where the ‘native’ encounters the ‘stranger’ and different strangers encounter each other – a movement and dislocation that form homes as complex spaces grappling and dislodging the dichotomies of private/public, familiar/strange, us/them, home/away, here/there, and belonging/unbelonging. In the visual I present, subjects of different Diasporas come together, questioning the aforementioned dichotomies and negotiating public space in their new ‘homes’ while embodying different forms of their cultural identities. The South Asian man in traditional clothing perched comfortably, the young Sikh man with his ‘Western’ clothing and shoes (alongside his religious symbols) occupied with his phone, and a Somali woman (a member of the newest community in this neighbourhood), dressed traditionally and religiously and carrying a bag from a multinational corporation selling 'western' fashion. Multiple identities and layered narratives around race, class, gender, religion, globalisation, capitalism, neoliberalism, material culture, and urban life coming together in social public space – embodying strangeness yet comfort, the tensions of multiculturalism yet the simplicity of community-building and coming together, the ease of being a collective and individual and yet holding the contradictions of the migrant experience. Their very presence dislodges stereotypes and dominant/violent discourses around migrants, migration, refugees, ‘Britishness,’ values, and multiculturalism. I’d also like to bring to your attention the right hand side of this visual. The practical heavy suitcases, reminders of the materiality and physicality of migration – each containing several stories, varied journeys, lived embodiments, and generational remembering and storytelling. And each mediated by broader sociological processes encompassing class, colonialism, borders, race, and gender, providing the subjects on the left side of this visual with a mobility, a means of movement, a background, a past, a reason for the present moment and space, and a future. On the top right corner, a red gleaming bag spells out an enthusiastic – I Love/Heart London – a present for the families ‘back home’ where stories of the migrant experience are presented to those who did not have a chance to leave. The tensions, contradictions, pleasures and solitude of migration wrapped up in a shiny material form that says - I am well in my ‘new home’ - and stirs the cosmopolitan aspirations of those in the ‘original home’. The first thing that came to my mind when I saw Rachel Tanner’s photograph – African Supermarket – was a text by feminist scholar Cynthia Enloe. Enloe (2001) in her seminal text, Bananas Beaches and Bases, argues that women’s roles in global politics have been largely ignored and under-examined. 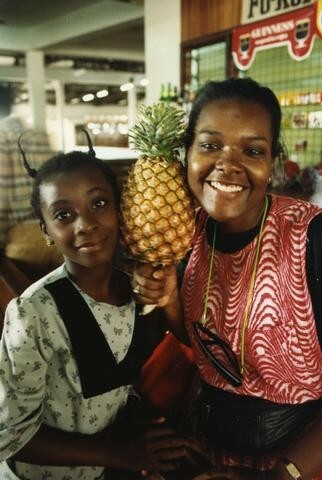 Using the examples of the banana industry in the Caribbean, the tourism industry, and foreign military bases she examines how women’s seemingly personal strategies – in their homes, private lives, domestic experiences – are also deeply political. She theorises that larger sociological processes of globalisation, capitalism, neoliberalism, and labor entwine the personal and the political – and argues that a simple visual such as a gendered advertisement that sells Caribbean bananas and tropical fruit to the US can contain multiple narratives of global importance. To me, her depiction of Carmen Miranda marketing bananas (on the front cover), smiling and fruit-covered, resonates strongly with Rachel’s image in spite of the difference in geographies, histories, lived realities, spatialities, temporalities, and meanings. While I do not know the exact context of Rachel’s image, it symbolises the role of the two women/girls in the image, not only as the stereotypical and very gendered providers of meals and groceries in the domestic sphere but also as consumers in the local, regional, and global market, as possible sellers and suppliers of the depicted fruit, as marketers, and as agents and actors in the global processes of labor and consumption. Rachel’s depiction of their presence in the supermarket (rather than the kitchen) pushes this idea further - breaking the binary of what is domestic and what is public, what is personal and what is political, what is in the home and what is in the labor market. It unpacks how sociological processes linked to the economy and politics work and the complexities they entail. Linked to the point above are also the photographer’s reflexivity, ethics, positionality, and agency that ask – How do we choose to represent the subjects of our work? How do we narrate other lives and realities? How do we incorporate the ethics of visual research into our larger disciplines in the social sciences? What is the relationship between “content, social context, and materiality of images?” (Pink, 2003: 183) How do we collaborate visually across disciplines? How do we use visual research in sociology as not only an academic intervention but also an activist one that decolonizes knowledge production and is mindful of the relationship between power and knowledge. Rachel’s photograph- African Supermarket- and her larger legacy serves as a solid starting point to consider these difficult questions and ground these conversations.